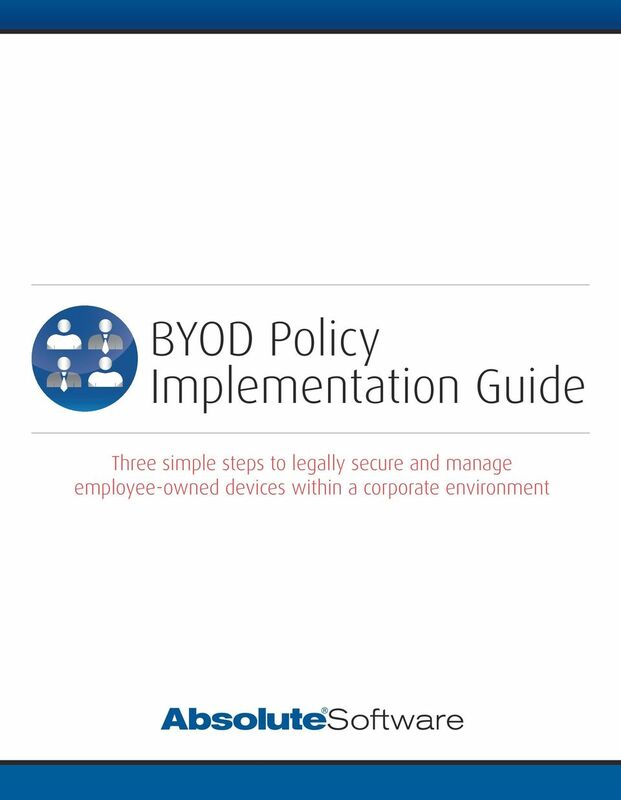 Download "BYOD Policy Implementation Guide. 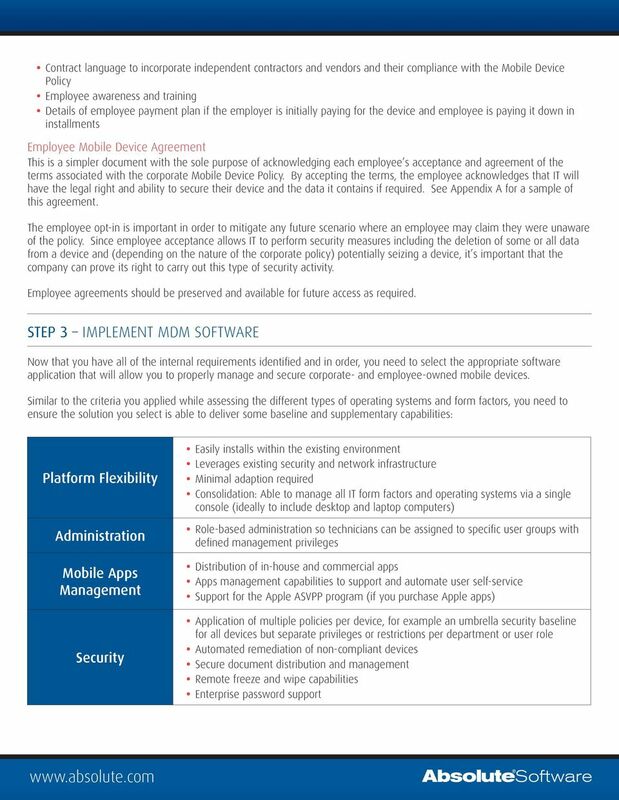 BYOD Three simple steps to legally secure and manage employee-owned devices within a corporate environment"
3 To begin, you must select the types of devices and operating systems that you are willing (and able) to support. It is not possible to standardize management for mobile devices since each operating system and even the hardware itself can impact IT capabilities. 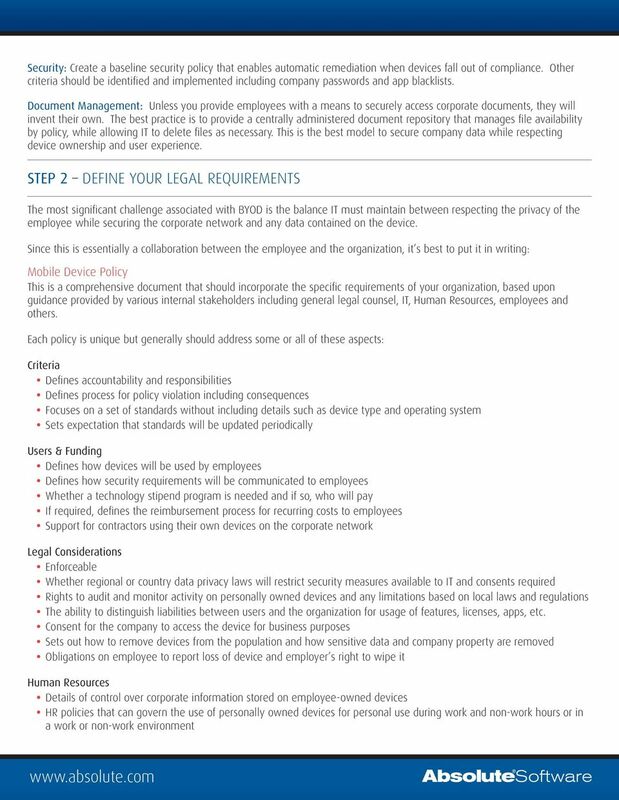 For your Mobile Device Policy, here are baseline criteria to use for assessing operating systems and device types: Security Built-in encryption Identification of jailbroken or rooted devices Enforceable passwords Geolocation capabilities Remote lock / wipe Manageability An API that enables Mobile Device and/or Mobile Application Management Extended MDM API via hardware vendor Support of Exchange ActiveSync policies that comply to company standards Apps A broad range of commercially available productivity apps Support for developing and deploying your own custom apps Availability of key apps specific to the form factor Based on these criteria, you should be able to define the list of form factors and operating systems you will support. Network Accessibility Next, you must create an environment that will support employee-owned devices during the enrolment process. The simplest solution is to set up a guest wireless network that is separated from the internal network. 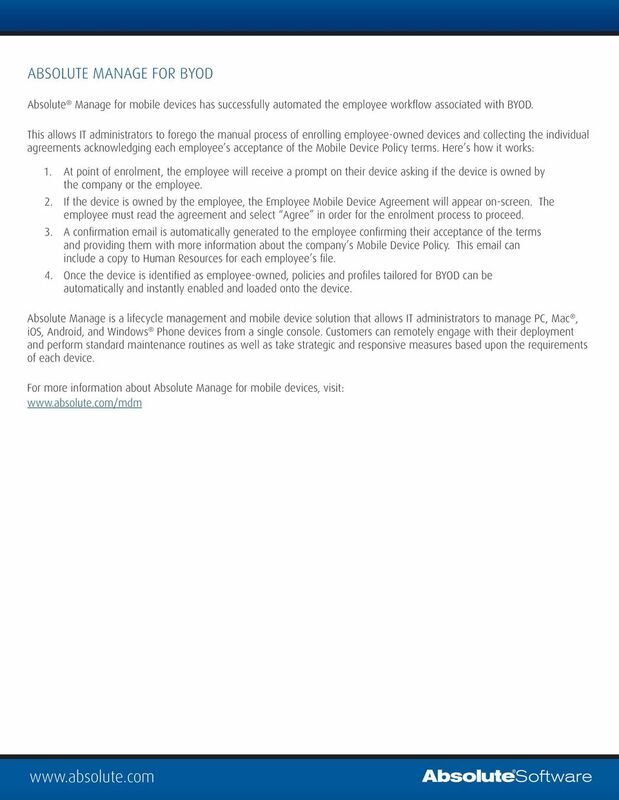 This can serve as the enrolment network for employee-owned devices. Once enrolled, your MDM solution should automatically evaluate and assign privileges and restrictions based upon the policies you ve created. Basic privileges include access to company , company Wi-Fi, and VPN configurations. These privileges should be tied to a policy that defines the security requirements of the company. Devices that do not comply with the security policy should be blocked. For instance: devices that are jailbroken, rooted or have blacklisted apps installed. 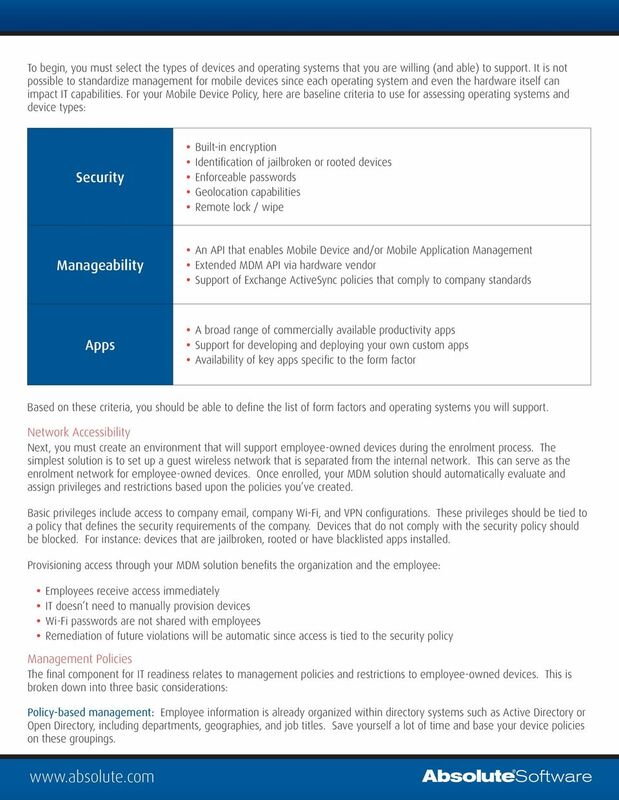 Provisioning access through your MDM solution benefits the organization and the employee: Employees receive access immediately IT doesn t need to manually provision devices Wi-Fi passwords are not shared with employees Remediation of future violations will be automatic since access is tied to the security policy Management Policies The final component for IT readiness relates to management policies and restrictions to employee-owned devices. This is broken down into three basic considerations: Policy-based management: Employee information is already organized within directory systems such as Active Directory or Open Directory, including departments, geographies, and job titles. 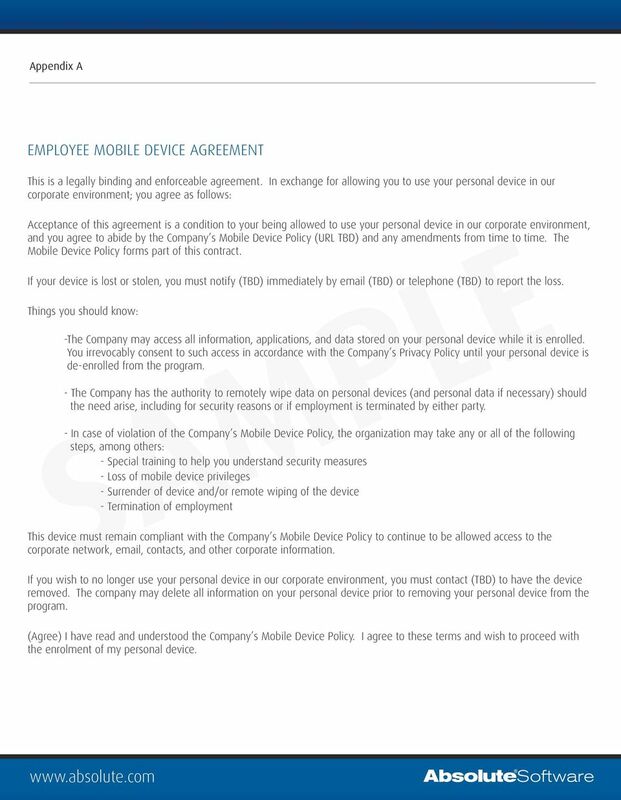 Save yourself a lot of time and base your device policies on these groupings. Mobile Device Usage Remeber This? The original, live presentation included the embedded video below: http://www.youtube.com/watch?v=bo-nft2mohi A Changing Industry Proliferation of Smart Phones and Tablets.